Mack’s® Hear Plugs® are the ideal ear plugs for musicians, as they ensure natural sound and comfort, while reducing harmful noise. 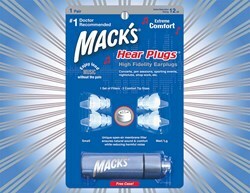 Now you can enjoy loud music without the pain with Mack’s® Hear Plugs®! 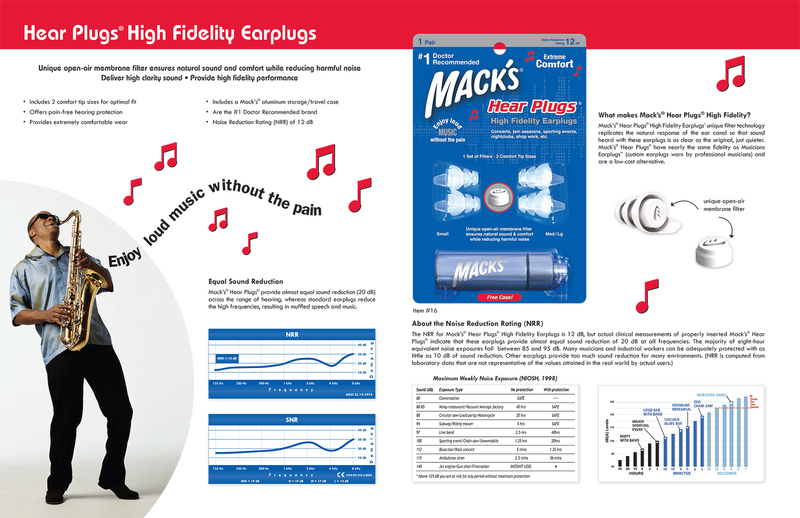 McKeon Products, Inc. is pleased to present Mack’s® Hear Plugs® High Fidelity Musician’s Ear Plugs. With unique open-air membrane filter technology, these earplugs ensure natural sound and comfort, while reducing harmful noise. This unique filter technology replicates the natural response of the ear canal so that sound heard with these ear plugs is as clear as the original, but at a lower volume. Mack’s® Hear Plugs® provide an ideal Noise Reduction Rating of 12 decibels (dB). A super-low profile design allows for inconspicuous wear, while the soft flanges ensure a great fit with maximum comfort. Each package includes two comfort tip sizes for optimal fit and one set of filters. They are washable and reusable and can be easily stored in the convenient aluminum keychain carrying case provided. Mack’s® Hear Plugs® are ideal for both musicians and concertgoers alike. In addition to these, Mack’s® now has a full new line of musician ear plugs, showcasing products that help people enjoy music safely. Now you can enjoy loud music without the pain with Mack’s® Hear Plugs®. Since 1962, McKeon Products, Inc. has led the retail ear care industry with its original and #1-selling Mack’s® Pillow Soft® silicone ear plugs. Mack’s® is the #1 doctor recommended ear plug brand in the U.S., with a variety of products designed for sleep, travel, music, swimming, shooting sports and overall noise reduction. Mack’s® is also the #1-selling brand of ear plugs and the official ear care line of USA Swimming. Today, McKeon manufactures a full range of health care products for consumers, including moldable and pre-molded silicone and foam earplugs for all your hearing protection needs. The Mack’s® line of products also includes ear drying aids, earwax removal aids, nasal devices, sleep masks, musicians ear plugs, ear muffs, and screen and lens wipes. McKeon, an ISO 9001:2008 quality certified company, is committed to supplying the highest quality, innovative products at the lowest possible price.